The SJ-HS Compact Digital Scale manufactured by A&D Weighing is the ideal scale for all weighing applications requiring a quality product at a very affordable price. The stainless steel weighing pan can be hygienically cleaned making this scale suitable for use in most food preparation areas. With a quick settling time of less than one second, the SJ-HS Compact Digital Scales won’t cause delays in product through-put on fast processing lines. Able to be powered for up to 800 hours using alkaline batteries makes the SJ-HS scales ideal for portable weighing applications or for use in areas where a power cable would be a significant inconvenience and possibly an OH&S issue. Available in four different capacities; from 1000g up to 12kg and able to be certified for Trade. 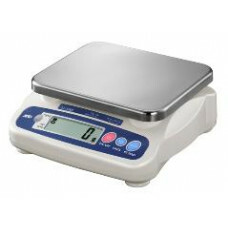 The SJ-HS Compact Digital Scale manufactured by A&D Weighing is the ideal scale for all weighi..